A very young Robert Rauschenberg is perched high on a ladder in front of a cathedral-style arched window, answering questions (undated video, link posted at http://judys-journal.blogspot.com). We hardly hear the interviewer. Rauschenberg seems totally relaxed, and really interested in describing his painterly approaches as accurately as possible. Rauschenberg began with “a ground of newspapers … the funnies …. I had an already-going surface, so there wouldn’t be a beginning to the picture.” Now this is a very interesting admission. 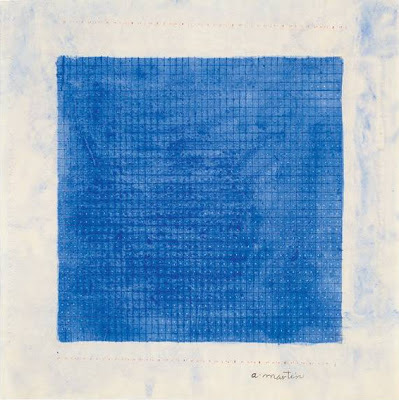 The blank canvas can be daunting, so I really like the idea of starting, as Rauschenberg says, “an already-going surface.” (Rauschenberg is usually pretty articulate, so the awkward structure of his phrase, “already-going,” seems particularly telling –- it was deeply felt). Robert Motherwell had said that he started paintings by making some kind of painted “gesture” on the canvas, and then, he said, he would have a problem to solve. Rauschenberg did not identify with Abstract Expressionists like Motherwell, but he says, in this video, that what he did take away from their “passion” was the fact that “they let their brushstrokes show.” But he also, tellingly, begins with a “gesture.” For Motherwell it was a sweeping brushstroke, for Rauschenberg it was “the funnies,” but the need for a prompt is the same. We all need to start somewhere. After he confirms that “there wouldn’t be a beginning to the picture,” because the funny papers had given him a starting point, he says this very strange thing: “And so it [would] all just be additive …. 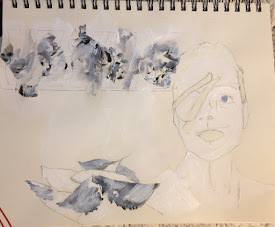 It doesn’t matter what’s inside.” I see what he means about the idea of “additive,” that, given the newspaper ground, he just starts adding more collage or paint or inks or wood. But then what does he mean by “It doesn’t matter what’s inside”? “Inside” of what? He doesn’t mean inside his own mind (because that does matter) or inside his plan for a painting (because there isn’t one). I think he means that it doesn’t matter what the bottom layer consists of, because it is “inside” the finished combine. It may peek through, but it is merely the starting point, and it is the accumulation of stages that is important. Rauschenberg continues, “it’s like when it stops because you’re dealing with an object, what it can make you think of how it could continue. You begin with the possibilities of the materials and then you let them do what they can do.” Again, the language is rolling out and he’s not policing it. … it would all stop. 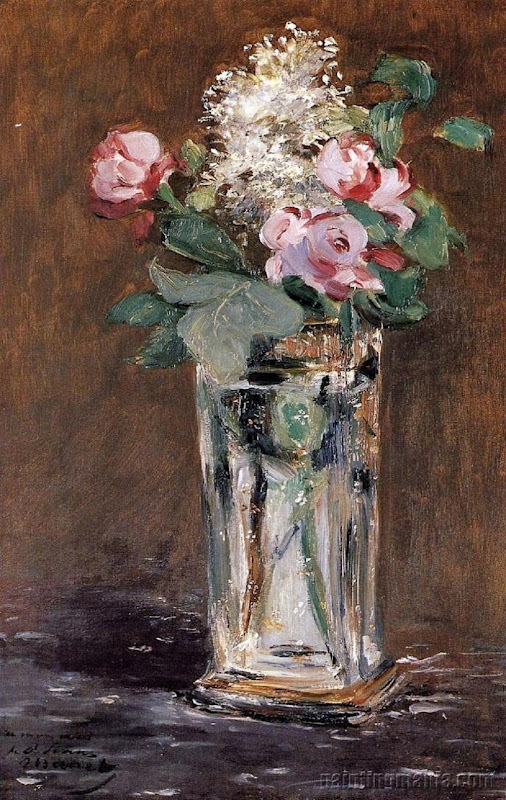 The initial gesture, the idea of adding elements to the combine or painting, the flow of work would all be compromised, because of the necessity of getting the vase and the water and the petals just so. And so there can’t be a hand-painted, technically-perfect, light-and-shadows-following-the-curve object for him. When you land on an object, it lands you. And I did love these paintings, but somehow the need to paint them stopped. I thought of them as exercises in freeing the odalisques, seeing them outside in a new context, a beach, a riverbank. But somehow they weren’t similarly freeing for me. And then my son said (not unkindly, but trying to help me see why it wasn’t working for me anymore) “Well, there you are. A woman stuck on wood.” And then I got it. That’s exactly right. The object “stops” the artist in his or her tracks. And that’s what Rauschenberg is saying. There is no date. Some people say it was the 1860’s. It could have started in the Renaissance. Perhaps it began in Venice, or maybe later, in Paris or New York. Art got loose. It found a hole in the fence. And it wouldn’t -- anymore -- be judged by how gently the artist draped painted lace falling over a hand, or the shadow thrown past a vase, or those columns receding in perfect order, diminishing to a horizon line. And as everybody began to chase after Art, and put it back in some kind of order, two things happened. A bad thing, but also a couple of good things. The bad thing is that auction houses, blue-chip galleries, and art fairs are now the arbiters of artistic “worth.” Art is only valuable when someone buys it. And what makes people pay more for one painting rather than another? The artist’s text: the lengthy bio, the MFA, the awards, the “buzz.” The written lists and hype now trump the actual image (see posts here from January 20, 25, 31 and February 8, 2012). So, continuing with that bad thing that happened: I just read Seven Days in the Art World. It isn’t new -- Sarah Thornton’s research was done in 2004-2007 -- but she was allowed into all the back rooms the rest of us can’t find. And I suspect that not very much has changed since the book was published. Here are a few examples of what Thornton found. As she sits in on a critique at CalArts, Thornton says the students say that using words like “creative,” “beautiful,” “sublime,” and “masterpiece” are all “embarrassing,” so these terms are not allowed. No “value judgments,” they say (65). But if not here, where? Thronton interviews the finalists for the Turner Prize of 2006, a very small world, with overlapping text. One artist, Tomma Abts, who eventually won the prize, tells Thornton during the process that “I have been part of the London art world for eleven years …. There are 4 artists nominated [for this prize] every year. I always know at least one.” Both Abts and another of the four finalists, Phil Collins [not the drummer], were awarded the Paul Hamlyn Award, both showed at the Istanbul Biennial and both showed at the Wong Gallery in New York. The Turner Prize is such a major award that betting shops give odds on the winner. And yet, it seems the choices, year after year, don’t range very far afield. Thornton also writes a chapter on her visit to the offices of Artforum, where she talks to the editors and to one of their contributors, Tom McDonough, an Associate professor of Art History at the State University of New York at Binghamton. McDonough says that critics “reward work not because they think it is the most important work being made … but because it’s a little corner that they can own” (170). It’s not even really necessary to comment on this, is it? Thornton watches the preparation for a 2004 auction at Christie’s and then sits in on the auction. The interviews in her auction-house chapter seem more moderated, the stated opinions more circumspect, but, still, the manipulation of the art market becomes clear. One of the people Thornton talks to, Josh Baer, says that “without auctions, the art world wouldn’t have the financial value it has. They give the illusion of liquidity …. If people thought they couldn’t resell … many wouldn’t buy a thing” (26-7). The sales placed in an order according to what will sell and raise the level of excitement, as a staff member confirms: “we lay out a sale commercially. If we laid it out art-historically -- chronologically or thematically – it would probably bomb. The first ten lots have to go well …. At around Lot Twelve or Thirteen, we’d better be entering a serious price point” (27). The auction seems more and more orchestrated, the crowd worked in hushed tones. An art consultant says that “People want to become part of the lifestyle …. To collect contemporary art is to buy a ticket into a club of passionate people who meet in extraordinary places, look at art together, and go to parties. It is extremely appealing” (34). 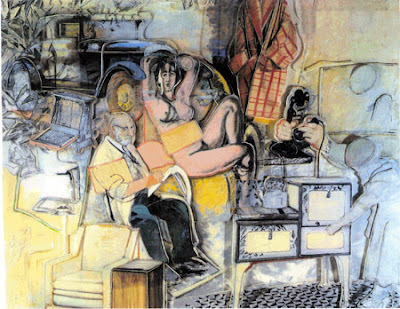 Thornton ends the chapter with this discouraging observation: “Even if the people here tonight were initially lured into the auction room by a love of art, they find themselves participating in a spectacle where the dollar value of the work has virtually slaughtered its other meanings” (39). So that’s the bad thing. So, now that art cannot be judged by chiaroscuro, or perspective, or established models of how to paint velvet, or a chalice, or the perfectly-proportioned body, is there a good thing that comes of this freedom? A good thing: freedom. Robert Motherwell said that the Abstract Expressionist artists thought that, since no-one cared what they did, they could do -- anything. But that’s the thing, isn’t it? How do you not care, as an artist, that the art world is so insane, and that no-one cares what you do? “Work engenders work,” Georgia O’Keeffe said, so that’s one good thing an artist can do: work, work in freedom. Work, and not care how many or how few people see it or buy it. You don’t want your art to be like the art in the student critique, where no-one can say that it is “beautiful.” You don’t want a critic to seize upon your work and award you a prize just because she has backed you into ”her” corner. You don’t want your art to be a piece of a box-tour “lifestyle,” just another liquid possession. Just keep working. Maybe learn to play the accordion or knit or box, too. Another good thing that can come of this wide-open field is the ability to see art in open studio weekends, in cafés, in galleries, and … wineries. We went to Napa and, up a residential and then increasingly twisty and fragrant road, we found the Hess Winery and Museum. And they are not kidding. It is a small, perfect museum. The forms behind the figure are crisp, the shredded receipts at the man’s feet sufficiently mysterious, the suit blocked loosely in, with all the wear and tear of life etched into it. The face is coming forward and receding, moving and blurred, flushed and graying. And the catalogue gives us a single quote from bacon: “One wants to do this thing of just walking along the edge of the precipice.” And the painting does just that. I tried to find out how it was that Donald Hess found all these works of art, because each work represents its maker accurately and each one astonishes. I never did find it. Hess is to be congratulated for throwing the doors open. Art got loose. And these two good things -- making art, no matter what, and seeing art, no matter where – can, if we let them, more than balance out the bad things in the current art-as-commodity world. In her wonderful Gertrude Stein Reader, Ulla Dydo offers corrected and annotated Stein texts. In her introduction to this small “play,” called “Identity A Poem,” Dydo notes that Stein is very tempted by “’audience writing,’” because she is thinking too much about what an audience would want. This was a state of mind that Stein’s new post-Autobiography of Alice B. Toklas life (and American book tour) had given her. Fame paralyzed Stein’s best writing. She knew that, and was trying to keep herself focused on what she called the “human mind,” which, Dydo explains, “is free of time, memory, identity, and free of the human need for applause” (p. 588). The line above is a little reminder from Stein to … herself. We all need these little reminders. Stein’s audience wanted more of the stories about Matisse and Picasso and life in Paris and … but she wanted to return to writing the works that are still, after all these years, resistant and very, very Modern. And Stein still, even after she became famous, had to pay to publish that work herself. Alice B. Toklas continued to publish (the “resistant” texts) after Stein’s death. It was heroic, really, all of it. But Stein had gotten to a place, fairly early on (I think it was with Tender Buttons, myself) where she knew what she wanted to write. How does one do that? How does a person discover the way? I think you have to just keep looking until you find it. You have to accept, along the way, that maybe you never will truly find your own style, the style so obvious and wonderful that you can stay with it forever, the way Stein did, molding and adjusting and not minding (mostly) if the audience can’t hear the rhythms the way you do. I don’t have any of Rothko’s writings that explain this shift. How did he know that the earlier works were not enough? Was Rothko wanting to distinguish himself from the other AbEx painters? Or was it that he felt something inside of him was not getting expressed? I know that he was intense, that he felt the work he finally arrived at was not meant to be “abstract” but, instead, tragic, filled with emotion. But I would like to know the ways the work unfolded to its end. And maybe that’s what each of them saw: the work was too “small.” I wonder, you know, I wonder about this searching for the perfect artistic creation. It’s about the perfect piece of art, the one that you know is it. It’s the same search that we all have for the landscape that seems like “home.” In the end, it really isn’t about audience, I think; it may be more about Stein’s idea of the “human mind.” It’s one’s own realizations, restlessness, a longing for the art to seem “real.” It doesn’t matter if we live in relative solitude, or become part of a wider artistic movement; we just have to be happy with the art we make. What about you? Have you decided on the “forever” work?